Flip lid upside down and stack as follows: Foam seal, then LCD clear window (remove protective coating from both sides). Place the (4) - 10mm M2.5 screws through the lid with the foam washer on the outside. Compress foam and thread the (4) - Hex Standoffs. Tighten each one hand tight, compressing the foam. Mount the water resistant button switch to the enclosure lid, rubber seal on the outside. Do not over-tighten seal. If it squeezes out of place, the button is too tight. Test enclosure lid for water tightness. Spray water around the LCD window and button, ensuring that water does not leak to the back side of the lid. Adjust as necessary. Using (4) - 6mm M2.5 screws, mount LCD module to the lid. Screws should be secure. Take care not to over-tighten. Connect the 3-pin cable connector to the LCD module. Strip wires about 1/2", fold in half stripped wire and screw into the switch screw lugs. Connect the 4-pin connector to the LCD. Note the color that represents the ground wire (green in picture). Mount OpenEVSE board to the mounting plate with hex stand-offs and (8) - M2.5 x 6mm screws. Mount ground bar from the top to the mounting plate using (2) - 5/8" self-tapping screws. Mount the Packard C240C contactor from the top to the plate with (4) - 1/4" self-tapping screws. Do not over-tighten the self-tapping screws. Tighten only until fully threaded and secure. Connect OpenEVSE AC line to the incoming AC side of the contactor. 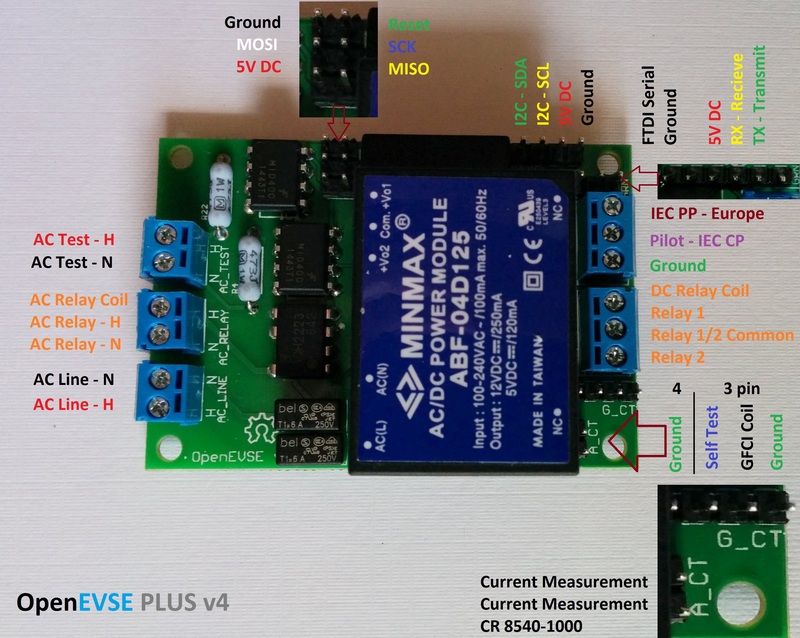 Connect OpenEVSE Ground to Ground Block. Packard - Connect contactor coil to the OpenEVSE AC relay output (v4 middle). Kits include a MOV V275LA20AP (red disk Metal Oxide Varistor) to reduce chatter noise created by the bouncing contactor coil. Connect the red MOV across the AC_Relay terminals on the OpenEVSE board. This shares terminal positions with the AC Relay coil wires. Connect OpenEVSE AC Test (v4 top block or V3 middle) to the hot line of the contactor output (J1772 side). V3 Hot only, V4 both Hot and Hot/Neutral. Mount plate to Enclosure box using q6 - self tapping screws (2 top, 2 middle 2 bottom). Thread one AC line (either side Hot1 or side Hot2) through the current-measurement CT (2-pin OpenEVSE Current CT) . If you are using the OpenEVSE 40A J1772 Cable, this is either the red pair OR the black pair of wires. Deluxe kits - Connect the current measurement CT to the 2 pin connector (either direction is fine). Connect the EV control pilot (CP) line (see below for common colors) to the OpenEVSE pilot screw terminal connection. The OpenEVSE Ultra Flexible Cable ends are factory terminated with sleeve ferrules. Other J1772 cables Data Bulletin must be terminated with appropriately sized and crimped sleeve ferrules. Insert terminated conductors into the lugs and securely tighten screws. Insert the AC Input cable through a Cable Gland and assemble loosely into the hole in the box. The OpenEVSE Input cables are factory terminated with sleeve ferrules. If using another input cable terminate the ends with the appropriate size sleeve ferrule. Strip the insulation off about 3/4" of insulation, terminate with ends sleeve ferrules. Insert terminated wires into lugs and tighten. The 50A kit supports both Split Phase US (Hot, Hot and Ground) and single Phase (Hot, Neutral, Ground) at a voltage of 208 - 240v AC. Connect the ground (Green) from the AC cord to the ground block. Connect the Ground from the J1772 cable to the ground block. Connect the 4 pin LCD cable. Ensure GND marked on LCD matches Ground on OpenEVSE board (pin closest to board edge). Power ON with programmer or USB serial if possible. If necessary power with AC using extreme caution. If display text is dim or not present adjust LED contrast (VR-1) located on the right side of the Display Module. Set "Service Level" to Level 2. Menu=> Setup => Service Level.